BedanCZ wrote: Next printing will be announced on mainpage as always ? That's what I'm assuming, but it's been almost 8 months since the last update ofor "it's in the works we just can't say when"
zemming wrote: Thank you everyone for your patience and understanding, I know things have been quiet for way too long around here. Rest assured we're still alive. I personally have not been able to commit the same amount of time to this project as in years prior thanks to my school workload these past semesters. Unfortunately based on our present status I do not anticipate a printing to be ready for Christmas. We definitely want more books as much as you guys. I'm still very excited for a 3rd printing and I know many people are looking forward to Horizons with it's five monumental books. We will continue to put work into the project as we have time; and will keep you guys updated when we make enough headway to guarantee a printing's success. In the meantime if you have any questions I will work to be more active on the forums. We can also be reached by email at FOEPrintProject@gmail.com, or feel free to email me personally at zemming@zemming.org. I don't think they're checkng emails all that much these days. I emailed them asking about the Pink Eyes PDF's several weeks ago and I still haven't heard a thing. Zetriax wrote: I don't think they're checkng emails all that much these days. I emailed them asking about the Pink Eyes PDF's several weeks ago and I still haven't heard a thing. Darn. Well time to start our own printing project then... lolz just kidding, I'm as busy as these guys are in my daily life, wouldn't want to take on another project. Spydude wrote: Darn. Well time to start our own printing project then... lolz just kidding, I'm as busy as these guys are in my daily life, wouldn't want to take on another project. I'd actually be up for doing a private printing project. Make just enough to give to those who help. The catch being, I don't want to read it til post-print. So any editing and chapter images would be up to someone else. I could do format editing and make the covers though, as well as the most important part, the printing. Zetriax wrote: I emailed them asking about the Pink Eyes PDF's several weeks ago and I still haven't heard a thing. Oh. Well sorry for jumping to that conclusion. 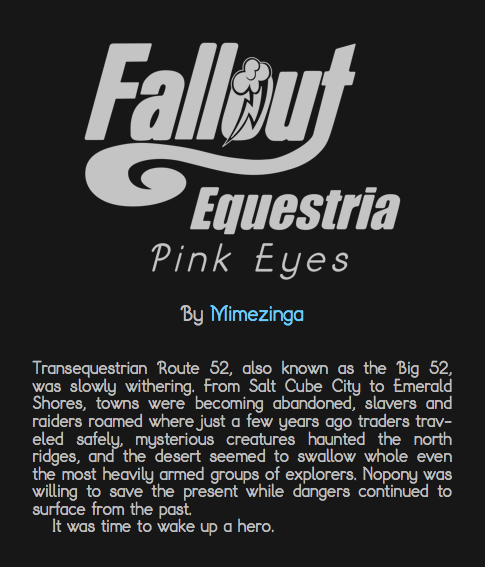 I have updated the Pink Eyes ebook, see the full changelog here! A welcome change for iBooks users who enjoy reading with the night/dark modes is that transparent images (page breaks and the FoE logo) now blend in with the dark themes (white on black background). There is now also a special Kobo version of the ebook, which is only meant for Kobo eInk devices. The regular file works just fine, but some prefer the KePub renderer over the default ePub renderer more (like me). You can find it in the "device specific" folder in the download link. The only difference is that this has <span> tags added that the KePub renderer expects. Without them, remembering chapter progress, bookmarks and annotations are not working. If you want a Kindle version, just use Calibre or KindleGen to convert to Mobi/KF8. Please redownload the Pink Eyes ebook! Found a bug in the Pink Eyes ebook! The last image in it was duplicated. If you have downloaded it after March 31, 2017 you should download it again! Sorry! I have no idea how it happened tbh.